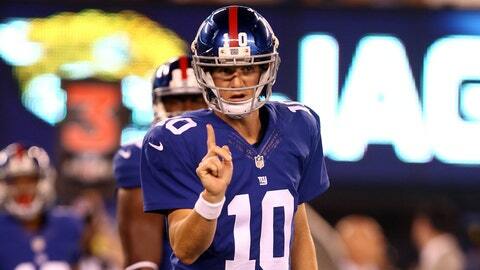 Eli Manning has learned how to protect the football first under offensive coordinator Ben McAdoo. For the first time in his career, New York Giants quarterback Eli Manning has finished the first three games of the regular season without an interception thrown. Manning has thrown 108 passes this season, and not a single one has landed in an opponent's hands. As usual, Manning refused to take all of the credit for his impressive streak. After spending the first 10 years of his career in a run-and-shoot offense that thrives on deep pass attempts and complicated option routes for the wide receivers, Manning has found things much smooth in Ben McAdoo's offensive system. Manning went 176 passes without an interception in 2014 — the longest of his career. This was also the first season that McAdoo stepped in as offensive coordinator.